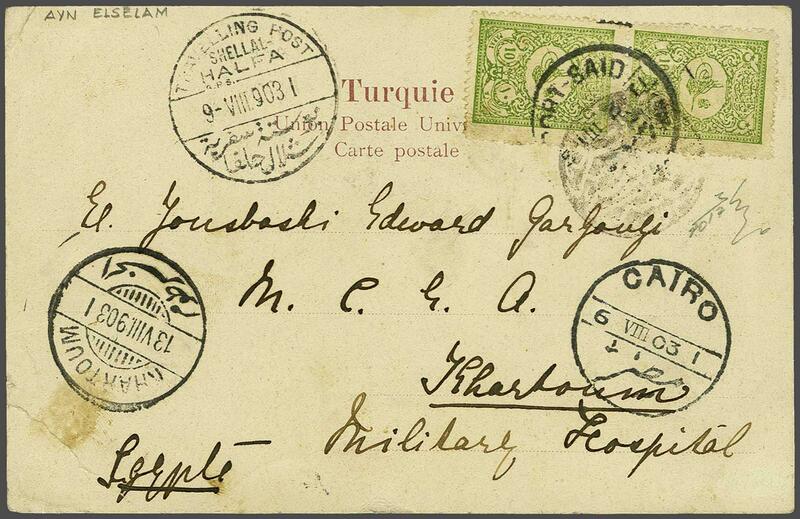 1901: Turkey 10 pa. yellow-green in a vertical pair used on 1903 postcard to Khartoum Military Hospital, Sudan tied by fine strike of circular negative seal of AYN ELSELAM in black (Isfila = RRR) on despatch. Port Said, Cairo (Aug 6), fine 'Travelling Post / Shellal / Halfa / GPS' datestamp (Aug 9) of transit and Khartoum arrival cds (Aug 13) all alongside. Corner bend but a fine strike of an exceedingly rare cancellation.